Approximate path traveled underwater overlaid on an aerial image from Google Earth. We provide a data set collected with an autonomous underwater vehicle (AUV) testbed in the unstructured environment of an underwater cave complex. The vehicle is equipped with two mechanically scanned imaging sonar (MSIS) to simultaneously map the caves’ horizontal and vertical surfaces, a Doppler velocity log (DVL), two inertial measurement units (IMUs), depth sensor, and a vertically mounted camera imaging the sea-floor for ground truth validation in specific points. 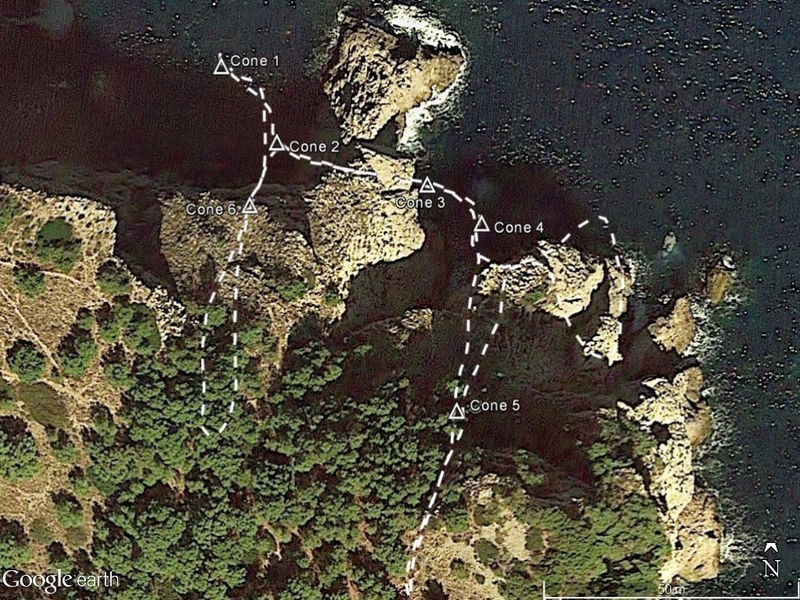 Here we present data using this testbed that was collected while guided by a diver, due to caves’ spatial complexity, during July 2013. For ease of use the original ROS bag files are provided accompanied with a derivative version combining imagery and human-readable text files for processing on other environments. full_dataset.bag (395 MB): ROS bag files containing the raw data for all the sensors except for the camera. sparus_camera.bag (3.3 GB): ROS bag files containing the data related to the camera sensor. cirs_girona_cala_viuda.zip (1 MB): ROS package containing scripts to visualize the data. Once downloaded you can unzip and copy the cirs_girona_cala_viuda folder into your ROS workspace. Then, copy the bag files inside your_ros_workspace/cirs_girona_cala_viuda/data. To visualize the data, launch the file named play_data.launch inside the provided package. /depth_sensor: DS2806 HPS-A pressure sensor data. /dvl_linkquest: LinkQuest NavQuest 600 sensor data. Contains bottom and water referenced velocities and other important sensor data. /imu_adis: Analog Devices ADIS16480 sensor data. Contains orientation as both Euler angles and quaternion. It also contains raw data for accelerometers, gyros, magnetometers and temperature, and an estimation of the gyro biases. /imu_adis_ros: Analog Devices ADIS16480 sensor orientation using standard IMU ROS message. /imu_xsens_mti: Xsens MTi sensor data. Same message type and same information as the topic /imu_adis. /imu_xsens_mti_ros: Xsens MTi sensor orientation using standard IMU ROS message. /odometry: estimation of the robot pose provided as a standard Odometry ROS message. /sonar_micron: Tritech Micron DST sensor beam data. /sonar_micron_ros: Micron data provided as standard Laserscan ROS message. /sonar_seaking: Tritech Super SeaKing DFP profiler sensor beam data. /sonar_seaking_ros: profiler data provided as standard Laserscan ROS message. /tf: standard ROS messages containing sensor offsets. full_dataset.zip (38 MB): Plain-text comma-separated values files, the first line of each file contains a header with the description of the data represented in each column. frames.zip (1.8 GB): The original color images (PNG format), following the naming convention: "frame_<frame_number>.png". undistorted_frames.zip (1.6 GB): The undistorted version of the images (using the calibration in the /camera_info topic of the bag files), following the naming convention: "frame_ud_<frame_number>.png". calib_frames.zip (329.3 MB): Calibration images, obtained in a water tank, that were used to compute the calibration contained in the bag files. 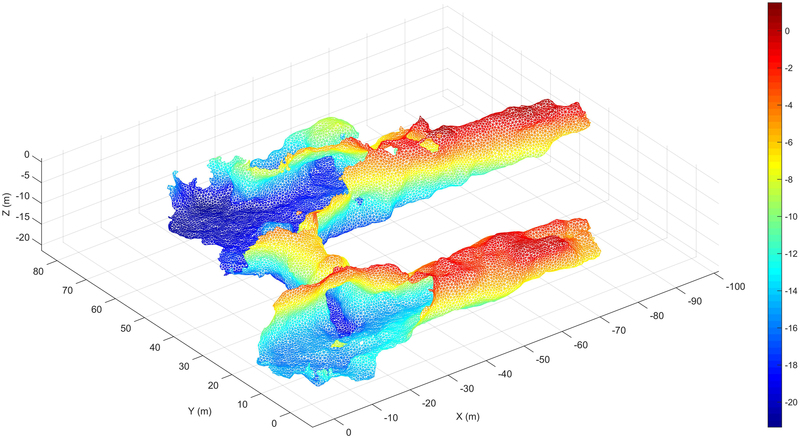 Mallios, A.; Vidal, E.; Campos, R. & Carreras, M.
3D representation of the caves using this data set and a SLAM solution from this paper (depth scale in meters).